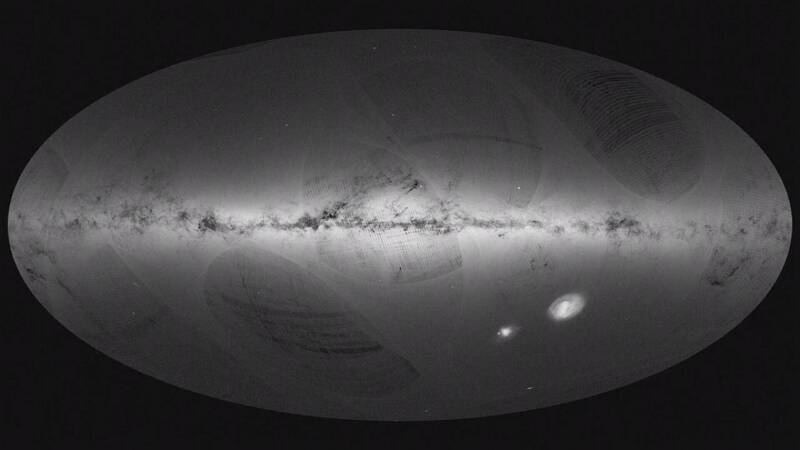 It features more than 1.1 billion stars and is the largest map of its kind ever compiled. If we can chart the motions of the stars we can help to disentangle the clusters and mergers of galaxies that came with ours and try to figure out how our galaxy was formed. The fruit of three years of hard work by the European Space Agency’s Gaia satellite, which has been scanning the heavens relentlessly, the catalog is part of a larger project to assemble the most detailed 3D map ever made or our Milky Way galaxy. “Gaia is a an astrometry satellite, it’s designed to measure distances and proper motion of stars mainly in our galaxy, with some outside our galaxy, with the intention that if we can chart the motions of the stars we can help to disentangle the clusters and mergers of galaxies that came with ours and try to figure out how our galaxy was formed, where these different things came from,” says William O’Mullane, Head of the Science Operations Division. Of the 1.1 billion stars in the catalog, 400 million have never been seen before, which some say could suggest the Milky Way is larger than previously thought. Gaia’s primary mission will be over in mid-2019 with a possible extension to 2024. “The design lifetime is six years. The potential lifetime is unknown because we don’t know when we’re going to run out of gas exactly but it’s maybe upwards of 10 years,” says William O’Mullane. In the future, Gaia is expected to discover tens of thousands of new star clusters, asteroids and orbiting planets in the Milky Way, as well as accurate positional data for about a million remote galaxies.